Ves Dimov, M.D. : Curriculum Vitae of Ves Dimov, M.D. Curriculum Vitae of Ves Dimov, M.D. 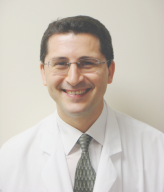 Dr. Dimov is an Allergist/Immunologist at Cleveland Clinic Florida and Clinical Associate Professor, FAU Charles E. Schmidt College of Medicine. He is an internationally known expert who serves in several leadership positions at the World Allergy Organization (WAO) and the American Academy of Allergy Asthma and Immunology (AAAAI). He is the Editor-in-Chief of WAO TV, and writes a monthly asthma column distributed by WAO to 30,000 members. Dr. Dimov has published more than 140 scientific papers, book chapters and abstracts, including the WAO Anaphylaxis Guidelines. He is the founder of internationally acclaimed websites, such as AllergyGoAway.com and PeriopMedicine.org, which have received more than 10 million page views, and are hyperlinked in the websites of 37 medical schools. St. Vincent Medical Center Internal/Case Western Reserve University Medicine Residency Program, Cleveland, Ohio. Medical University Sofia, Bulgaria; M.D., 6-year program. Allergist/Immunologist, Department of Allergy and Immunology, Cleveland Clinic Florida. Allergist/Immunologist, Assistant Professor of Medicine and Pediatrics, Section of Allergy, Asthma, and Immunology, University of Chicago, Illinois. Chief Medical Resident (during 3rd year of residency), St. Vincent Medical Center Internal/Case Western Reserve University Medicine Residency Program, Cleveland, Ohio. Resident Physician, St. Vincent Medical Center Internal/Case Western Reserve University Medicine Residency Program, Cleveland, Ohio. Member of the World Allergy Organization (WAO) Web Editorial Board, 5-year term. Technology use for education; sustainable vegetable gardening.